Heavy metal are dumped into China's freshwater lakes. Should we think twice before we upgrade our gadgets? 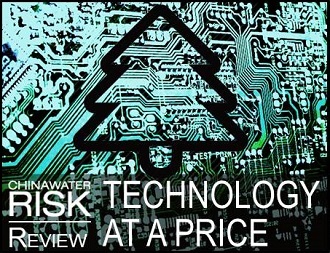 Since 2010, China Water Risk has been covering the activities of the Green Choice Alliance in China (GCA) and the release of, so far, six research reports focusing on environmental pollution associated with the IT supply chain. The environmental cost of today’s ubiquitous electronic gadgets continues to be extremely high. Specifically, GCA has pushed over 200 companies including iconic names such as Apple, Siemens, Nokia, Microsoft and Panasonic, to explain environmental concerns over their operations and importantly corrective action; the aim, to push for more sustainable production and procurement methods. On August 1st 2013, five members of the Alliance (Green Jiangnan Public Environmental Concerned Center, Institute of Public & Environmental Affairs, Friend of Nature, Huanyou Science and Technology Research Center, and Nature University), jointly released the seventh report in the series– ‘Who is Polluting the Taihu Basin’. Some of the IT companies were found to be discharging “massive amounts of polluted water”, including considerable quantities via hidden pipes. Testing conducted onsite and in a laboratory, indicated that Foxconn factories were responsible for serious heavy metal contamination of sediment in the Huancanjing River, with high probability of toxic impacts, as a result of illegal discharge of wastewater. Similarly the NGOs also further investigated another river in the basin, the Louxia River, and it was determined that waters from this highly polluted River were being pumped into the adjacent Hanpu River. Testing indicated that the likely pollution source was Unimicron a manufacture of printed circuit boards with a poor environmental record. The report identified foul smelling black wastewater from a number of Foxconn factories being pumped directly into the Huangcangjing River. Samples of underlying sediment were found to have a nickel concentration (a known carcinogen) of 2,060 mg/kg, almost 40 times over the National Oceanic and Atmospheric Administration’s (NOAA) Sediment Quality Standard. The concentrations of copper (which can damage kidney and liver function and reduce crop yields) and nickel were 532 mg/kg and 175mg/kg respectively. Sediment samples from the Louxia River which flows into the Hanpu River similarly measured well over NOAA standards for copper and nickel, with levels of 21,600 mg/kg and 797mg/kg respectively, i.e. 80 and 15 times above the NOAA’s standard. As with previous research, GCA approached the identified companies as well as others, asking them to respond to the study’s findings. As of the time of publication of the report, there had been no response from Foxconn or Unmicron. According to Ma Jun, Director of IPE however, following the release of the report, the local government followed up quickly, taking a clear stance by having open dialogue with the NGOs and Foxconn also showed concern by supporting a further re-investigation. The question remains as to who such companies as these supply to. In this instance, initial investigations highlighted the brand HTC as a customer of Unimicron and along with other companies HTC was approached to raise questions about the polluting nature of their suppliers. HTC is the only company of 33 to remain silent, even four months after the report was published. To put this water resource in perspective, Taihu Lake which is located in the Yangtze River Delta, with an area of 2,452 km2 is the third largest freshwater lake in China. Taihu Lake Basin supports 30 million people including important cities such as Shanghai, Suzhou, Wuxi, Changzhou, Jiaxing and Huzhou, all of which are vital to China’s economy. 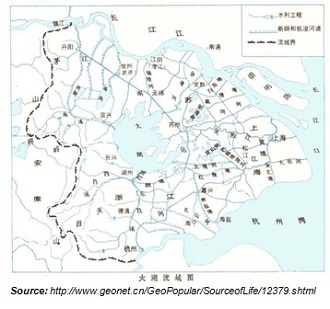 In 2010, the Taihu Lake Basin contributed 10.8% of China’s GDP with only 4.3% population and 0.4% land area in the country. This per capita GDP is 2.5 times the national average. 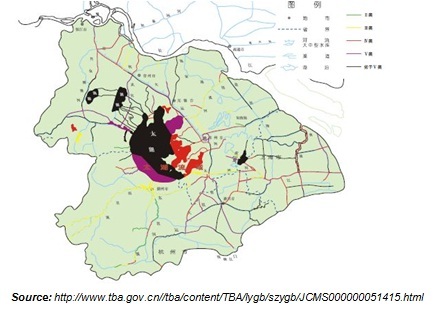 Yet, according to the 2011 Water Resources Report of Taihu Lake Basin, 58.4% of the lake water was worse than grade V (shown in black in the map below) meaning 58.4% of the lake water is unfit for human touch and cannot be used for any purpose. The map on the right shows the water quality situation in Taihu Lake Basin in 2011. 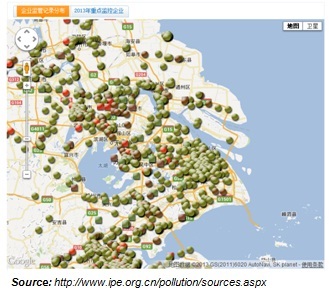 According to IPE’s database, there have been 434 official violation records in Taihu Lake Basin since 2006 (see map below) and judging from this latest NGO report, it is likely that there are many violations that haven’t been recorded by the Ministry of Environmental Protection. In the current environment, with NGOs and the community increasingly requiring accountability, listed companies such as HTC, are in a vulnerable position. Trading in Pangang Group Vanadium & Titanium & Resources Co Ltd (000629.SZ) for example (a company principally engaged in the manufacture of steel) was halted on the Shenzhen stock exchange on 12 August 2013 because of water pollution violations brought to light by these Chinese NGOs. This caused disappointment amongst investors about their poor levels of information disclosure (For more read Toxic Waste to Toxic Assets). In addition, Lomon Corporate and Shandong Doguide Group Co., Ltd. failed twice with IPO applications for their titanium business, due to environmental pollution concerns. Taking a step back, Ma Jun, points out that addressing the pollution of Taihu Lake concerns the safety of drinking water for millions of people and that environmental authorities should intensify pollution supervision for the IT and electronic industries within the Basin. Polluting companies are seemingly not afraid of fines at the current levels, but they would seriously be concerned about any compulsory closure of their facilities, the resulting loss of business and market share. He believes that the world’s leading IT brands, such as HTC, should cooperate with local stakeholders to address pollution from their supply chain. On the other hand, customers should exercise their purchasing power and buy from environmentally responsible brands. As the Director of Green Jiangnan Public Environmental Concerned Center, Fang Yingjun points out, there is no shortage of money or technology, impetus is the largest missing piece of the puzzle. Unfortunately, this situation is probably exacerbated by the fact that the add-on cost from wastewater treatment can reduce a company’s competitive strength if its competitors keep discharging untreated wastewater and its customers’ simply don’t care about any environmental impact. Corporate Conscience: Beyond Charity – Why are so few companies effectively mitigating water risk? Is it time for the conscientious corporate to transition water from purely charity and compliance to a core business activity? Ying is China Water Risk’s consultant based in Beijing. She conducts research & analyses on water related issues and writes editorial content for website. Prior to joining China Water Risk, Ying was the Chief Representative Officer of a European consulting firm in Beijing. She has worked on a wide variety of climate change, environmental and loan/technical assistance projects funded by the National High Technology Research and Development Program of China, the National Basic Research Program of China, European Commission, the World Bank, the Asian Development Bank and British Embassy in China amongst others. Ying has a Master’s degree in Environmental Engineering from Chinese Academy of Sciences and a Bachelor’s degree also in Environmental Engineering from Beijing Jiaotong University.